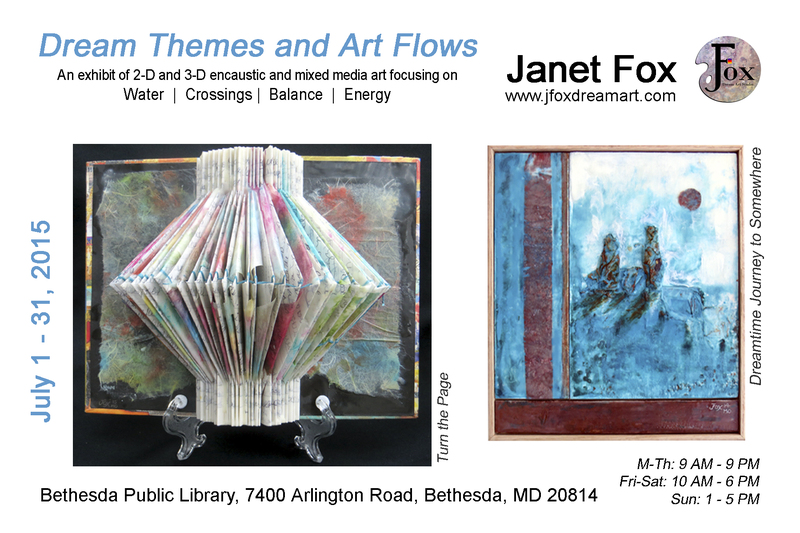 Janet Fox is the Featured Artist for July 2015 at the Bethesda Public Library in Bethesda, MD. I’m thrilled to be the Bethesda (MD) Public Library Featured Artist from July 1-31, 2015! I invite you to stop by to see a selection of 12 art pieces. In addition to the art, I have included companion text about each piece. This solo exhibit “Dream Themes and Art Flows” focuses on four themes: water, crossings, balance and energy. I chose these themes because I often dream or think about them. And while making art, I often find myself lost in the creative process, losing track of time in a sort of “art flow,” similar in many ways to what others describe while exercising or highly focused on other activities. The 3-D piece shown above, Turn the Page, is part of a new series transforming some of my dream journals into art. My next post will explore more on this topic. Thanks for all your support and best wishes!